In-play betting means betting on a sports event when the event is live. This can mean betting on a football game, tennis game or basketball game while it’s going on. There are some offers that requires an in-play qualifying bet, such as Ladbrokes’ “bet £20 in-play, get £10 in-play free bet”, or Betfred’s “bet 3 x £25 in-play on the French Open, get £25 free bet”. All exchanges allow you to lay in-play bets, so matching a bet in-play is the same as matching a bet pre-match. You can place an in-play bet with a bookie, and lay it with any exchange to qualify for an offer risk-free. There are a few differences when matching an in-play bet with a pre-match bet. Placing and laying in-play bets will have a small delay before it is placed or layed, which can last up to 5 seconds. Odds may change during this delay, especially if a goal is scored, so your bet may not have been placed. So please make sure your bet is placed, and a confirmation message is displayed before laying the bet. In-play bets will have poorer odds when compared to pre-match odds. Finding a close match may be harder, but it’s still very possible. The best markets to place in-play bets in my experience is the win-draw-win market, and the over/under goals market, as they usually have the best matches with the exchange. The odds for in-play bets can move very quickly. Sometimes, odds can change very significantly, especially if a goal is scored. For an example, if a game is 0-0, and a team scores, the odds for that team may drop by a lot. The best time to place an in-play bet is during half time, when the odds will not move as much, as there is no chance for a goal to be scored. However, as the odds will not move much, if there are no close matches, it is likely there won’t be any close matches for the rest of the half time. However, it is safer to place a bet during this time, even with a poorer match. If half time isn't suitable for you timing wise, you can check in on the odds from the bookie and the exchange from time to time during the game to see if there are any close matches. Have the Calculator tool ready, and enter the odds in as they change until you find a match you are satisfied with, and place your bets first. Wait till the in-play delay is done, till the bet confirmation is shown, then lay the bet. Sometimes, if the odds for our selection were to change when we are placing our bet, the bookie would cancel the bet, which would lose us money if our lay bet is successfully placed. If there are no close matches, wait till half time, where all the odds would slow down and stop moving as much, then try to find close matches. It is safest if you could find a close match during half time, as there would be no unexpected odds changes. Lay odds move downwards - Not to worry! This is a great outcome as your liability is now a bit less (this is the same as on Betfair Exchange). 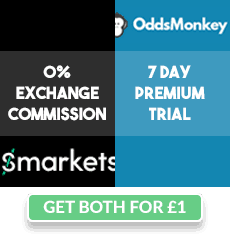 Lay odds move upwards - I recommend still placing the same lay stake, but you can then go back to the calculator and put in the higher odds lay odds. This will give you a slightly lower lay stake, so you can then place an additional back stake to reduce your lay stake slightly on Smarkets (this is harder on Betfair as they have a minimum £2 stake, whereas Smarkets have a minimum 5p stake). For example, if you original lay stake was £10.20 but the revised lay stake is now £9.90, then just put a 30p back bet to reduce the lay stake from £10.20 to £9.90. If you are new to in-play betting, you may want to start with a lower stake and try to familiarize yourself with it first, as it can be tricky to do. The odds move very quickly and you will need fast fingers to back and lay the bets before the odds change by too much.